Welcome back to yet another installment of the fun game, Six Degrees of Kool Books. Last week, DJ posted about characters from Andrew Peterson’s On the Edge of the Dark Sea of Darkness, Book 1 of the Wingfeather Saga. I have not read this series, but am intrigued, and may have to look it up in the near future…. except that I vowed not to get sucked into a bunch of new books this summer, because I have editing to do! Editing, editing, all sorts of editing, you’ve no idea how much I have to do! (If anyone can tell me what song that is a paraphrase of, well, you get 10 points). Someday, when I’m rich and famous, I’ll have real prizes for these sorts of contests. Anyway, reading through the character descriptions, I actually found a connection rather quickly… which is odd, I know. DJ described the children’s mother Nia as someone who is dignified, has steady confidence, and is a rather inventive cook. Now, I don’t know much else about her personality, but based on that description I instantly thought of a main character in another book that I absolutely love: Princess Cimorene, from Dealing with Dragons by Patricia C. Wrede. Cimorene is a rather feisty princess who would much prefer learning magic, cooking, and sword-fighting to needlepoint and etiquette, and is getting rather tired of hearing, “That simply isn’t done.” as the reason for why she should or should not do things. When her parents arrange for her to marry a noble, but boring prince with whom she has nothing in common, Cimorene must take drastic action. She runs away from home, follows the directions of a frog (and doesn’t stray from them), and finds herself volunteering to be kidnapped by a fire-breathing dragon – who agrees to the deal when she finds out that Cimorene can read latin, do a small amount of magic, and is quite good at cooking Cherries Jubilee. I need to do a full-on review of this book… but for now, I’ll just tell you a bit more about the characters. First you have Kazul, the dragon. She is a very practical-minded individual, and not prone to much of a temper, though if she does get riled up, smoke literally begins pouring out of her nose and she’s not very good at making sure not to breathe fire in the wrong direction (or to make sure no innocent bystanders are in the way). She is mostly kind and good-hearted though, and excellent to have on your side in a fight. Then you have Morwen. Morwen is a witch, and about as good at being a “proper” witch as Cimorene was at being a “proper” princess. Naturally, this means that they get along famously. Morwen is always surrounded by rather a lot of cats, has an enchanted house with a doorway that can lead to anywhere in her home, and her rooms are all capable of magically expanding or contracting depending on the size of her guests. She makes a very tasty apple cider, and has a very dry sense of humor. She is nothing if not extremely pragmatic. Therandill (Prince of Sathem by the Mountains) is the prince to whom Cimorene was supposed to be betrothed. He comes several times to attempt to rescue Cimorene, even though he doesn’t really want to. Cimorene sees him as being quite handsome, “but he isn’t anything else.” He is quite chivalrous, however, and Cimorene finally discovers how to get rid of his unwanted attempts to “free” her by sending him to rescue one of the other princesses (claiming that they have been “imprisoned” for longer, and thus have seniority). The villains of the story are definitely the wizards. Zemenar is the head of the Wizard Society. He is devious and sneaky, and is constantly attempting to put plans in motion that will gain him more power than he already has. He is extremely powerful in magic. His son, Antorell, is also usually involved in these schemes. Antorell is pompous and arrogant, and not a very powerful wizard at all. He is not very smart, either, and is fairly easily confused or manipulated. Woraug is a dragon who takes an instant disliking to Cimorene and argues against Kazul “kidnapping” her. He has a violent temper and is always rather surly or unpleasant. So, that’s a pretty good list of characters to choose from, I’d say. I definitely recommend this book to anyone who enjoys fantasy, fairy tales with a twist, witty humor, and lovable characters! 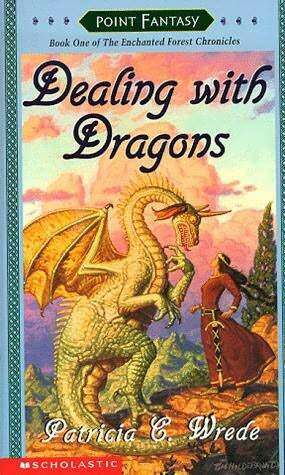 Seriously, it is one of my all-time favorite books and series. Now you have me singing the “Busy, busy, dreadfully busy,” song from Veggie Tales. One of my all-time favorites. I may not comment often, but I always enjoy your posts, Jenelle! Thank you for your kind words love knowing that people are actually reading over here! You know, another friend of mine recently recommended this book to me as well so I may have to add this to my “to read” list as well. Like you, I’ve also been in the throes of editing so I may not get to it for a while. Lots of characters to choose from this time. Nothing springs to mind right away, but I’m sure I’ll think of something! If I had to choose a favorite YA fantasy series that wasn’t Chronicles of Narnia or the Hobbit… this would probably be it. Probably. Almost 100% positive. Woah, that’s some pretty rarified company. I may have to check this out sooner than later! Not to hype it up or anything… I just really like it that much. But then, I have a strange sense of humor, and this series caters to it.